Large-scale changes in regional floras provide direct information about changes in biodiversity through time and enable the evaluation of conservation targets. We compared the distribution ranges in 2004 of Estonian native terrestrial flora with the distribution ranges before 1970, using the Atlas of Estonian Flora. Relative persistence was related to species endemism, commonness, occurrence at its border of the global distribution range, main habitat type, sensitivity to human impact, life-form, conservation category, and Red List category. A literature-based database of the flora of Estonian habitat types was used to evaluate relative persistence of the flora of different habitats. Changes in the flora are largely dependent on human activities. The decrease in mire and grassland habitats and the increase in forests are reflected in the persistences of related species. Flora of mire habitats decreased the most. The fact that an almost ten-fold decrease of grasslands has not resulted in as large a decrease in the ranges of grassland species could serve as evidence of the extinction debt of these habitats. We also found a greater decrease among habitat specialists than habitat generalists and lower average persistence of the species of species-rich habitats. 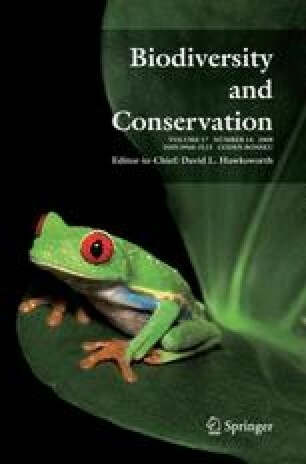 Our data show that current prioritization of species for conservation is in concordance with needs, as reflected in the changes in the range of species. However, conservation has not been entirely successful: the decrease of protected species continues. Our simple method for summarizing large databases was effective for the evaluation of large scale effects of conservation actions. Michael Hutchings, Dirk Schmeller and anonymous reviewers provided valuable comments to this manuscript. This study is based on research financed by EU FP6 project EuMon, target financing project no 0362481s03, grants no 6048 and 7567 from Estonian Science Foundation and grant no P6062PKPK06 from Estonian University of Life Sciences. Marguerite Oetjen kindly corrected the English. List of sources used to compile a database of species presence in various habitats. Habitat types and basic descriptive characteristics of their flora used in this study.